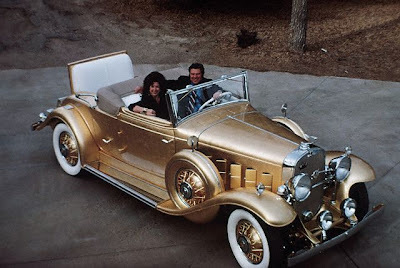 Garden City, KS- Mr. and Mrs. Jack Smith sit in their 1931 "golden" Cadillac. It's not painted on--the entire car is done in 23.75 caret gold foil. Smith has restored many cars and this time he wanted something different. Smith spent three years turning his car into a "golden oldie" and it is now valued at $500,000. The outside door handles are sterling silver, inside handles are 24 caret gold, and the gearshift knob is platinum set with 18 rare gems.